Moving from California to London was a major life change in many ways, but I have realled enjoyed it. And the time has flown. Last week marked four months since I moved to London. In honor of the occasion, I thought I would share a list of the things that have been the biggest surprises about living in the UK. As an American, I know very little about the British royal family. However, one of the first things that I noticed about them was that Queen Elizabeth was married to Prince Philip. Not King Philip, but Prince. I was perplexed. Shouldn’t Queens be married to Kings? I always thought that was the way of royalty. Well, it turns out I was wrong - or, at least partially wrong. Since Queen Elizabeth is the sovereign (i.e. she inherited the crown), traditionally her consort remains a Prince so as to not outrank her. If the crown had come to Philip, and he was married to Elizabeth, he would have been king and she would become Queen. But when the crown passes to a female, their spouse traditionally remains the Prince-Consort. It is putting it mildly to say that I was shocked when I found out that I needed to get a license for my TV. On top of the cost of the TV and the monthly service charges, the UK requires that you purchase a yearly TV license for £145.50 ($230.00) (although it’s only £49.50 if your TV is black and white). The license gives you the right to operate a television at a given residence. To be perfectly honest, I’m not sure why I need one, only that it is the law. They do enforce this, though I have yet to hear of anyone that has been sent to TV jail for not having a license. Here is the secret I need you to keep though – I don’t have a license. When I first heard about them I didn’t have a TV. And now I have approximately one hundred other things I would like to spend that hundred and fifty pounds on. So please, be a pal and don’t tell the authorities on me. I’m not sure how this all started, but Brits are kinda funny about their sandwiches - they like them premade and pre-packaged. Almost every grocery store, coffee shop and convenience store sells a variety of premade sandwiches. At first I was a little put off by these pre-packaged snacks as in the States, sandwiches are made to order. Although, I do have to say that despite the fact that the sammies are premade, they do come in a startling variety of options. Sweet corn and tuna on your mind? We’ve got those. Have a hankering for prawn, BLT or brie, grape and chutney? Got those too. And while I do have a fondness for the egg mayo variety (that’s egg salad for you fellow Americans), I do wish there were more places where I could get a customized sandwich that didn’t exist prior to my order being placed. 4. Why would you want to move to London? Moving to London was a hassle. There are no two ways about it. And in my quest to find an apartment, set up my TV and internet service, get a new cell phone, and a dozen other things, I spoke to a lot of people. A LOT of people. And my typical conversation went something like this. Them: You moved from California to London? Them: Why would you want to do that? And no, to answer the question that I know you are ready to ask, they did not want to know which of the amazing things about London had brought me here. They were honestly confused as to why I would want to leave California and move halfway around the world. I couldn’t understand why they weren’t thrilled to be living in one of the most exciting cities in the world. What I’ve decided is that it can be very difficult for people to appreciate the place that they live. It’s just like they say, the grass is always greener on the other side. When I lived in Los Angeles, I never gave much thought to the fact that the weather was always nice and that I lived mere minutes from the ocean. When I moved to Northern California, I never appreciated the fact that by driving in one direction I could be in San Francisco in an hour. By driving in the other direction, I would be in Lake Tahoe in the same amount of time. The point? It doesn’t matter where you are, or where you go, if you always want to be somewhere else. I am working on being present and enjoying my time in London. One day when I live somewhere else, I want to be able to look back on my time in this city and feel grateful for all that I got to experience. I don’t want to waste my time thinking that being somewhere is would be better. I am continuously surprised by the number of people who smoke in London. Every morning, I have to walk through what my co-worker and I have dubbed as “the tunnel of smoke” – a walkway were everyone tends to gather to get their last cigarette before entering the office for the day. Not that many people smoke in California. After all the money spent to make your skin, teeth, hair and nails look perfect, you just don't ruin them all with a cigarette. Hell, my aunt is the mayor of Calabasas, California, where they have banned smoking in public areas and mandate 80% of rental apartment buildings to be smoke free (she's also a Justin Beiber fan). So that’s the attitude that I am used to when it comes to smoking. 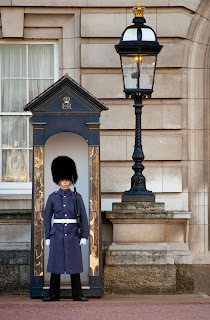 Finding accommodation in London was a hassle. In the States, you find an apartment building, walk into the office, ask if they have any apartments available and possibly sign a lease. In the UK, you need a realtor. Your realtor will help you find and visit available apartments and help you negotiate a lease (this is especially important because properties fly off the market like hot cakes, with a number of them being rented sight unseen due to the competitive market). Oh yea, and they charge you a hefty fee to do it. That’s on top of the six weeks deposit and the fee you pay to have the apartment inspected. And don’t forget that if you are paying for all of this out of a foreign bank account (because you need a permanent address in order to open a bank account in the UK) there is an extra charge for that. All in all, this is a very expensive process, time consuming and difficult process. So make sure you like the place you rent you may never be able to afford to move want to move. The US definitly has the right of things when it comes to finding a place to rent. 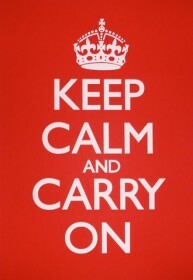 In 1939, British Ministry of Information produced the original “keep calm and carry on” posters. These fliers were intended to help raise moral during the Second World War. Beginning in 2000, this motto has taken the pop culture world by storm. In Sacramento I had a British gentleman who worked for me for two years. He had this slogan on a mug, so I was no stranger to the words when I arrived in the UK. However, I have been surprised by the fact that I see this mantra everywhere. And not just in its original form either. I have seen countless variations from “keep calm and go shopping”, to “keep calm and jingle all the way” for Christmas, and my personal favourite “keep calm and throw a tracker jacker nest at the careers” (for all you Hunger Games fans out there). While it does get a little old to see the same slogan repeated everywhere, I do appreciate that the Brits can embrace, and have fun with, a bit of their history. I’m only counting this one as half because it wasn’t really a surprise in the way the others were. Even though there are delays sometimes, and the occasionally delusional fellow passenger, I think the public transaportation system in London is magnificent. Not only does the London transportation system cover all areas of the city, but it is cheap! I think this is fantastic, especially considering that in Sacramento I used to spend more for my parking pass every month than I did on my car insurance. I almost don't even miss having a car here. Don't forget "Keep Calm and Chive On"
Hehe, as a Chivette it definitely occurred to me to include that one. I have been duly chastised. KCCO.